Microsoft SharePoint has become one of the world’s most popular tools for creating websites. However, it needs to be monitored closely to ensure that resources are performing correctly. The performance of servers, applications, and services must all be managed and monitored to ensure long term performance. SharePoint Administrator tools are key for keeping an eye on these resources. SharePoint administrator tools with performance monitoring provide network administrators with visibility over network resources. This means better troubleshooting and a better experience delivered to the end-user. In this article, we’re going to look at the best SharePoint administrator tools. 1 Why do I need a SharePoint Administrator Tool? Why do I need a SharePoint Administrator Tool? As one of the most widely-used website creations, document management and storage solutions, SharePoint comprises an incredible number of different services. Servers, farms, and applications are all instrumental in delivering the SharePoint services modern enterprises are familiar with. Yet each of these components needs to be managed effectively in order to ensure a stable service. With a SharePoint administrator tool, you can monitor these components for problems like latency and conduct more detailed troubleshooting if a problem is found. When small performance issues can have a big impact on end users, it is even more important to keep a close eye on SharePoint performance. SolarWinds Server & Application Monitor is an application monitoring solution that can be used to manage SharePoint performance. With this tool, you can troubleshoot to reveal the cause of slow page load times and latency. Issues can be divided up depending on their location, server infrastructure, and application. All of this information is shown to you in a dashboard view with tables and meters providing you with key metrics. Key metrics monitored with SolarWinds Server & Application monitor include requests per second, request wait time, throughput, and rejected requests. When put together this information gives you all you need to know to measure the performance of SharePoint resources. 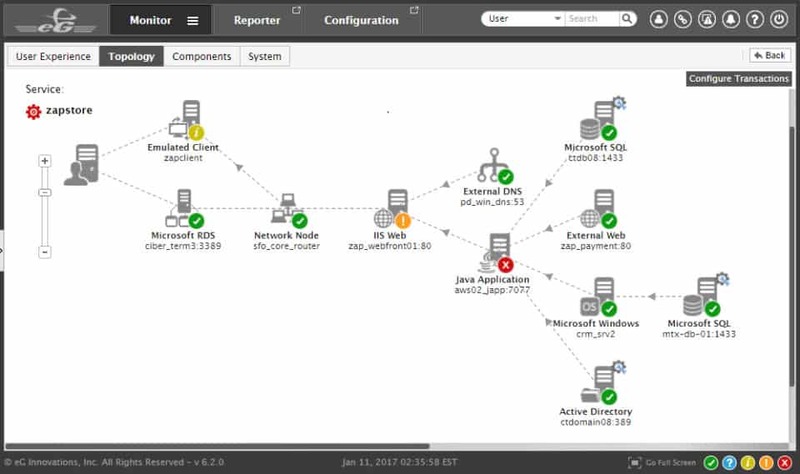 For the most effective troubleshooting, SolarWinds Server & Application Monitor offers native integration with SolarWinds Web Performance Monitor. With this integration, you can pinpoint specific transactions or connections that are causing pages to load slowly. If you’re looking for a lightweight and easy to use SharePoint monitoring tool, SolarWinds Server & Application Monitor is a good choice. The price for SolarWinds Server & Application Monitor starts at $2,995 (£2,308). There is also a 30-day free trial version you can try here. PRTG Network Monitor is an infrastructure monitoring platform that can monitor SharePoint servers and applications. 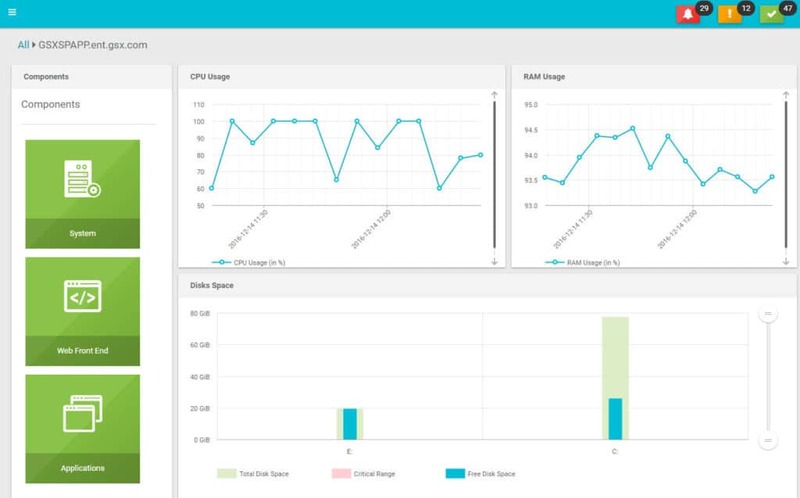 PRTG Network Monitor comes with pre-configured sensors for SharePoint Server and be customized to measure the performance of connected servers. For example, the WMI SharePoint Process Sensor is a sensor designed specifically for monitoring SharePoint servers. On the WMI SharePoint Process Sensor you can monitor the number of current page requests, number of active threads, number of executed SQL queries, CPU utilization, global heap size, template cache size, and more. Other preconfigured sensors like the Windows IIS Application Sensor and the PerfCounter IIS Application Pool Center are also capable of monitoring SharePoint resources. Every sensor is monitored by alerts as well. The alerts system is one of PRTG Network Monitor’s strongest features. Once a predefined threshold has been crossed inside a sensor, the user is sent an alert. For example, if the CPU usage of a SharePoint server goes above a certain limit the user is sent a notification via email, SMS or push notification. All thresholds are customizable so that you can decide when and how you want to be notified. PRTG Network Monitor is available for free for less than 100 sensors, making it a great option for smaller enterprises. The paid versions of PRTG Network Monitor start at $1600 (£1,233) for 500 sensors. The pricing model is scalable and can be increased depending on the amount of sensors and server installations you require. There is also a 30-day free trial version available. ManageEngine SharePoint Manager Plus is a SharePoint management tool built specifically for SharePoint. Through this web-based tool the user can configure individual or bulk user permission changes and create groups. For monitoring SharePoint there are SharePoint Usage Analytics. Usage analytics are divided into search reports and traffic reports. Search reports show the user a list of users’ most popular search keywords and the frequency of object searches for individual users. In addition, rank reports show you the top sites (by hits) and the top pages (by page views and unique visitors). Audit reports are available in XLS, CSV, PDF, and HTML so that they can be easily passed on to other members of your team. ManageEngine SharePoint Manager Plus is an available download for Windows. For SharePoint management specifically, this is one of the best tools on this list. However, if you’re looking for more of a performance monitoring solution, there are many other tools that are a better match. There are three versions of ManageEngine SharePoint Manager Plus: the Trial Edition, the Standard Edition, and the Professional Edition. The Trial Edition is available for 30 days with all the features of the Professional Edition. The Standard Edition is a limited version which costs $945 (£728) with 50 out-of-the-box reports. The Professional Edition includes all the features of the Standard Edition but offers permissions management for $1195 (£921). You can download the free trial version here. 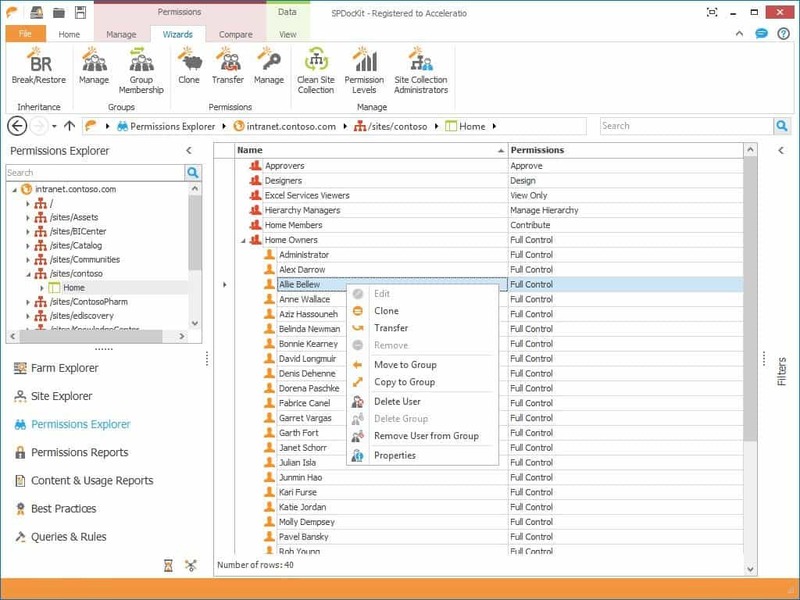 SPDoCKit is a SharePoint administration tool with auditing and analytics included. This tool can generate SharePoint documentation, best practice reports, audit reports, analytics reports, and manage permissions. Creating farm documentation allows you to eliminate the need to paste data into the platform manually. The tool does this by scanning your network and pulling configuration settings from your SharePoint resources. All of this information is then generated into a Word, Excel, or PDF document. For managing permissions, SPDocKit provides you with a real-time perspective of user permissions. You can see this in a table that lists the name of users and the permissions that they hold. SharePoint groups can be created and deleted as needed in just a few clicks. When it comes to monitoring SharePoint usage, SharePoint Analytics and Usage Reports are the features that make this happen. With SharePoint analytics, you can view usage data such as number of hits per farm, site or subset, time of last assess and the list of site visitors. This information is shown to you as tables and meters. There are two main pricing categories for SPDocKit: Farm and Consultant. Farm packages are intended for use by those managing on-premises farms. Conversely, the Consultant packages are for those enterprises that work with clients. A Farm annual subscription costs $2,499 (£1,926) per farm per year. If you want to add SysKit Insights then this price increases to $3,499 (£2,697) per production farm. The Consultant annual subscription costs $1,999 (£1,541) per year. There is also a free trial version that you can download here. GSX is a SharePoint monitoring tool that offers performance monitoring for SharePoint 2007, 2010, 2013, and Office 365. This tool automatically discovers all connected SharePoint servers. Once the servers have been discovered, the SharePoint Overview display shows the status of your servers broken down into different roles. Servers are categorized as SQL servers, applications servers, and web front-end servers. The monitoring experience offered by GSX is sophisticated enough to detect and troubleshoot a variety of performance issues common with SharePoint. Latency, mail connectivity, and DNS resolution are just a handful of the things that GSX is capable of monitoring. For instance, you can create a graph of the response time of a SharePoint web service. For further control, you can configure profile alerts. 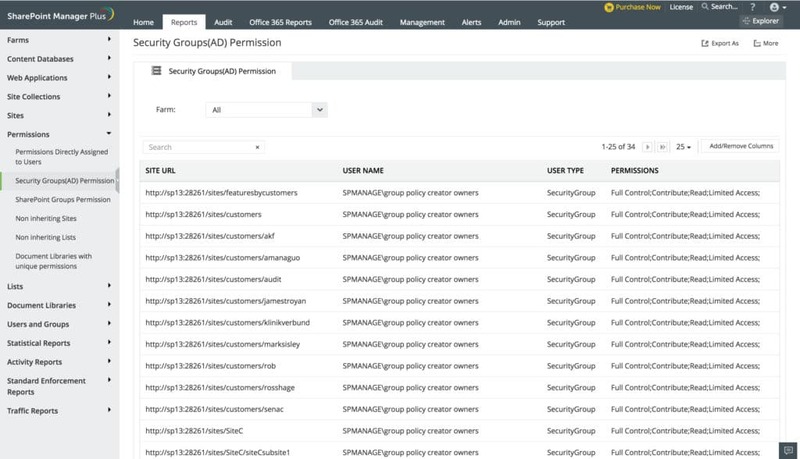 Alerts are sent by email, SMS, pager, pop up messages, and SNMP traps to update you on changes to SharePoint. Alerts can be prioritized by severity and escalated to another member of staff if there is no response. GSX offers the right balance of SharePoint performance monitoring and administrative capabilities. The combination of the two makes GSX one of the standout tools on this list. The price for GSX Monitor & Analyzer is $1,010 (£778.60) per server, per year. There is also a 14-day free trial that you can download via this link here. eG Enterprise is another widely-used SharePoint monitoring solution. With this tool, you can monitor everything from sites, web applications, web parts, databases, logs, and events. All of this information is available to you through one user interface. You can monitor the availability of SharePoint services to make sure that a key service hasn’t gone down. There is also real-user monitoring so that you can view the quality of the user experience delivered on your site. In other words, you can find performance issues before your end-user does. To make sure that you can respond to issues promptly, eG Enterprise automatically discovers SharePoint applications and infrastructure dependencies. You can view this infrastructure as a map which shows you how each service connects to the next. This is invaluable for running troubleshooting and pinpointing the root cause of a problem. In order to view the price of eG Enterprise you’ll need to request a quote. You can download the free trial of eG Enterprise via this link here. 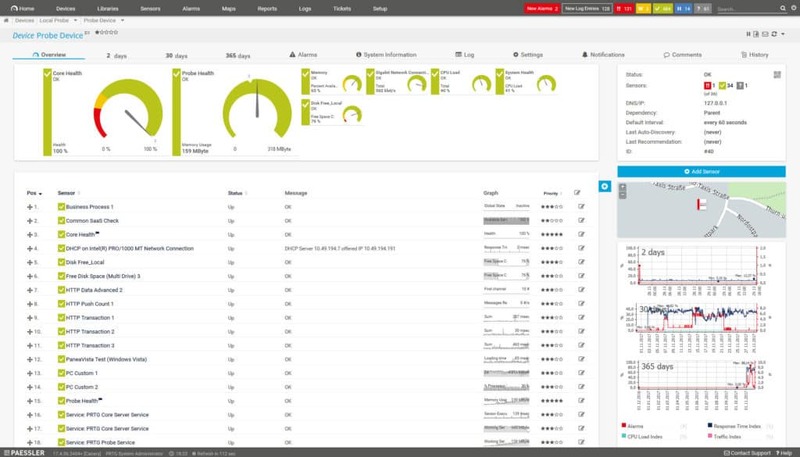 Metalogix Diagnostic Manager is another SharePoint administrator tool and performance monitoring solution. Metalogix Diagnostic Manager supports SharePoint Server 2016, Server 2013, Foundation 2013, Server 2010, Foundation 2010, Windows SharePoint Services 3.0 SP1 or later, and Microsoft Office SharePoint Server 2007 SP1 or later. Monitoring the health status of SharePoint resources is very straightforward. On the dashboard, you can view the health status of SharePoint broken down into different segments. For instance, there is a pie chart showing the status of Farms, Server Groups, Servers, and Pages in isolation. Resources are categorized as Critical, Warning, or Ok so that you know if you need to take action. However, you can also configure alerts to keep you notified automatically. Alerts on Metalogix Diagnostic Manager are configured by setting performance thresholds. Notifications will let you know if a key service goes down or if content growth is occurring. 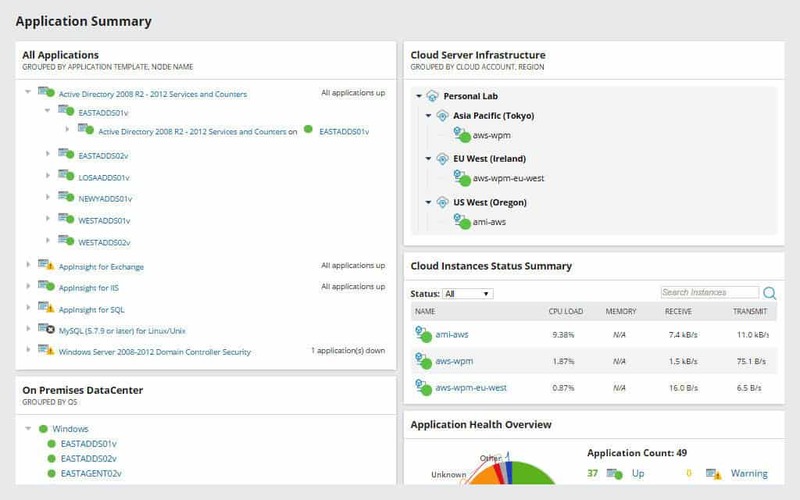 Alerts are sent regardless of whether resources are located on-premises or in the cloud. 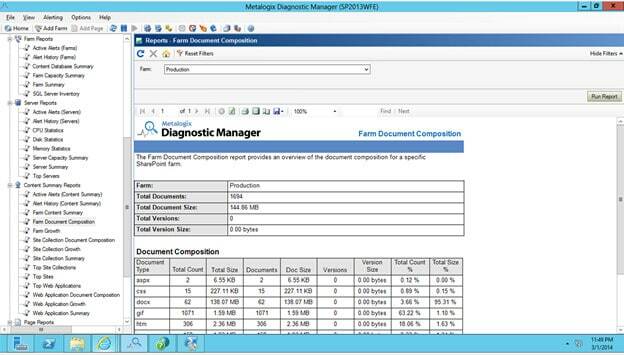 The simplicity and health monitoring features offered by Metalogix Diagnostic Manager render it one of the more accessible SharePoint administrator tools on this list. To see the price of this product, you need to contact the sales team directly. However, you can download the free trial version of Metalogix Diagnostic Manager available here. 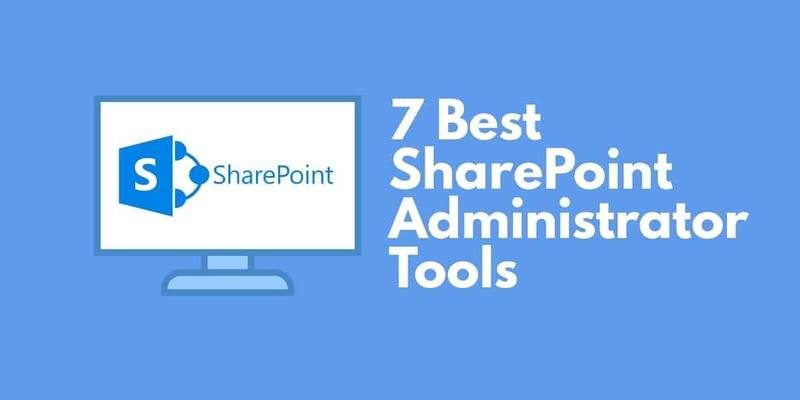 If you are unfamiliar with SharePoint administration tools then SolarWinds Server & Application Monitor, PRTG Network Monitor, and ManageEngine SharePoint Manager Plus are some of the most user-friendly tools available. SolarWinds Server & Application Monitor can detect the most common performance issues that plague SharePoint users. The dashboard doesn’t overcrowd you with information so you are unlikely to miss anything. PRTG Network Monitor is notable because it offers the use of 100 free sensors and sensor-driven monitoring experience that can be easily established and configured. Having alerts tethered to these sensors maintains visibility over SharePoint and increases the effectiveness of performance monitoring. For managing users and other administrative tasks, ManageEngine SharePoint Manager Plus has the design and features to function well within an enterprise environment. Changing user permissions and provisioning groups is easy to do compared to many other tools on the market. No matter what the needs of your organization are, we recommend that you try out at least one free trial before committing to a product. Testing out a product before deployment will make sure that it has all the capabilities you need to monitor SharePoint effectively.